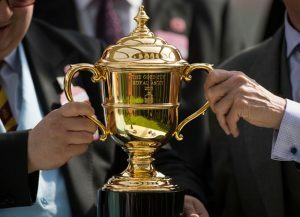 Often deemed the most prestigious event for Stayers (horses best suited to running over long distances), the Ascot Gold Cup is a held each year at Ascot racecourse over a distance of 2m 3f 210 yards. The race takes place in June of each year as part of the Royal Ascot meeting and four year old horses and above are eligable to enter the race. Inaugurated in 1807 there is clearly a wealth of history attached to this routinely competitive Group one affair. The winner of the very first Ascot Gold Cup in 1807 was Master Jackey winning 100 guineas (don’t spend it all at once!). King George III and Queen Charlotte attended the event. In 1844 Nicholas I of Russia attended the race, so there is a real royal flair to proceedings during this period. With an event with such history, a trend is bucked in that the most successful ever horse at the event occured relatively recently. Not only that but it was done in style, as Irish thoroughbred Yeats was the winner of the Ascot Gold Cup in 2006, 2007, 2008 and 2009, a feat not achieved before or since. Leading jockey at the event is Lester Piggott with 11 wins between 1957 and 1982. The 2018 winner of the Gold Cup was 7/4 joint favourite Stradivarius ridden by Frankie Dettori and trained by John Gosden. The purse for the race was a cool £500,000 with £283,550 going to the winner.